The London story is one of migration. Not just migration from overseas, but within the UK and especially within London itself. 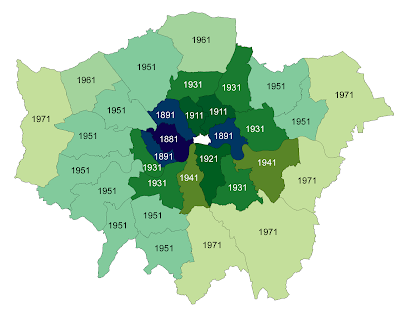 The population of Greater London was in decline from 1939, and only started to pick up again after 1981. However, the population peaks for each borough tell a story in themselves of people moving outwards, deserting the inner core and, come the 1960s and 1970s, leaving London altogether.